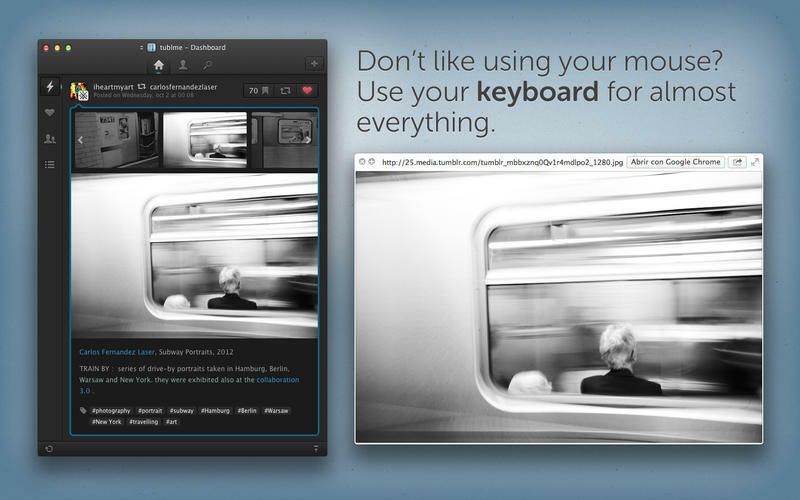 Tublme is a beautiful and powerful, yet easy to use, Tumblr desktop client. It makes browsing Tumblr a whole new experience with its minimalistic approach. As in Twitter, a list is a selected group of users. Just add people (you don't even need to be following them) to a new or existing list and you'll be able to check the list timeline whenever you want. Apart from keeping a history of your recent searches, Tublme me lets you save the ones you want. So you prefer using the keyboard? No problem: browse the Dashboard, make a search or like a post using simple keyboard shortcuts. You can add as many Tumblr accounts as you want and change from one to another instantly. Are you uploading a very heavy post and, meanwhile, you have finished writing a new one? No need to wait. Publish it and Tublme will take care of it all. Did your Internet connection failed? Was there an error while uploading? Did you have to cancel your upload? Tublme saves your post automatically for you to try again later. When publishing a post, when you have new followers, etc. And if you prefer using Growl, no problem, Tublme is compatible. Tublme is optimized for the new MacBook Pro Retina Display. - Markdown, HTML and RTE support. If you need to get in touch with us to ask something, send us your comments, etc, you can reach us at support@tubl.me, visit our Tumblr at http://tublme.tumblr.com, our website http://tubl.me or follow @tublme at Twitter. * Tublme sends your login information directly to Tumblr using Xauth over SSL. We never read your login information. * Fixes a crash in OSX 10.8.5.